Microsoft has released the newest build of Windows 10 Insider, version 16226, to developers on its fast-track release list. Build 16226 for Home and Professional editions strips out the SMB1 server software exploited by the NSA, and later by the authors of the WannaCry malware. The client SMB1 remains, so that users can connect to devices still using the protocol, but server-side is gone. The Enterprise and Education versions strip out both client and server SMB1 code. "The change only affects clean installations of Windows, not upgrades," Microsoft noted on Wednesday. "We are making this change to reduce the attack surface of the OS." SMB1 was developed almost 30 years ago and has been superseded for years, but is hanging around like a fart in a spacesuit in Microsoft's legacy code. No one at Redmond wants it anymore and it has been actively trying to persuade users to get rid of it for ages. The protocol is unsafe and targeted by miscreants and nasties. "It was designed for a world that no longer exists," said Ned Pyle, program manager in the Microsoft Windows Server high availability and storage group. "A world without malicious actors, without vast sets of important data, without near-universal computer usage. Frankly, its naiveté is staggering when viewed though modern eyes. I blame the West Coast hippy lifestyle." Meanwhile, Hyper-V has also seen some changes in the new build with a new VM Sharing feature. The UI has an icon in Virtual Machine Connection that compresses a VM into a ".vmcz" file for export. The new build also fixes some of the issues the operating system has been having with the mixed reality code that works with HoloLens. Issues with downloading software and headset reliability have been fixed, speech recognition gets an upgrade, and the OS now supports 360-degree video. Tabs have been tweaked to make sure the X to close them can always be reached. The favorites system can now be viewed like a directory tree. Right-clicking on a website address now includes the option of editing it, rather than deleting and installing a new one if a URL changes. Admins can enforce group bookmark policies. Bibliophiles using the browser to read .epub format books can now add notes to the text and ask Cortana for searches within the text. Books bought in the Windows 10 Store are now also transferable among any device using the new OS and any notes or searches will sync automatically. 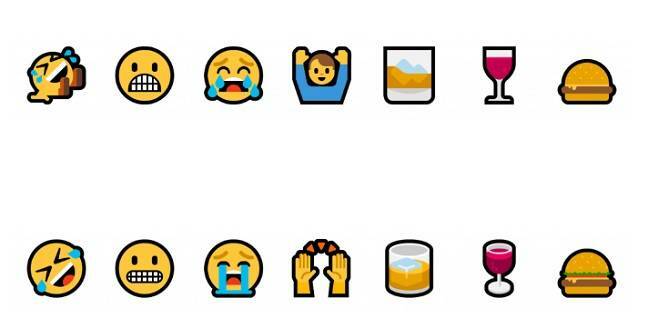 For the millennials and those who want to act like them, Microsoft has refined its emoji images and added in the latest Unicode sigils. Emojis can, in many cases, be gender specified and there's now a search bar in the emoji box. PS: The latest version of Internet Explorer – at least 11.413.15063.0, update 11.0.43 – has a little button in the tab bar encouraging people to use Edge instead. "I almost opened Edge by accident – phew, lucky escape," Reg tipster Bernard told us.